Wyatt’s family came to town for the weekend. Jena & Lance drove out from Missouri, Wynn & Heidi flew in from Arizona, & Wade drove down from Idaho. The only one’s missing were Jacob & Melinda! On Friday we didn’t do much. We just hung out at Lois’s during the day, and that night Lois babysat all the grand kids while we went to dinner & a movie. In the afternoon we all went to the pool. All the different toys there were a real hit with the kids. 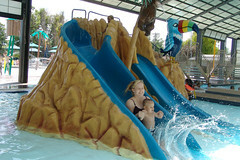 Susannah even braved the big water slide by herself a couple times (once she even had to be fished out by a lifeguard!). It was fun to play with all the nieces & nephews. 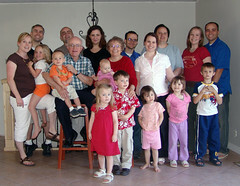 On Sunday we had dinner at Jared & Velda’s house. Lois even managed to get everyone to pose for a family picture. Unfortunately my camera was dead, so we only got one shot! But it turned out fine. It was great to have everyone in town, and a lot of fun!